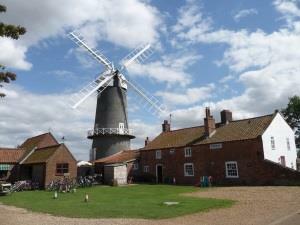 Bircham Windmill01485 578393work WindmillCome and enjoy this family run attraction with something for everyone. Bake some bread, climb to the top of the mill. Play in the garden. See the sheep being milked at 2pm daily. Sample some homemade bread, cakes and cheese all on sale in our tearooms and to take home from our bakery. Gift shop, gallery, mini museum and regular events through the season. Camp site, holiday cottages and shepherd's huts available. Come and enjoy this family run attraction with something for everyone. Bake some bread, climb to the top of the mill. Play in the garden. See the sheep being milked at 2pm daily. Sample some homemade bread, cakes and cheese all on sale in our tearooms and to take home from our bakery. Gift shop, gallery, mini museum and regular events through the season. Camp site, holiday cottages and shepherd's huts available. There is a garden, sandpit and play area for young children. Guinea pigs, rabbits and a donkey to stroke. You can also see the sheep and feed them. There is a treasure hunt around the garden for the children too.